A Kitchen In Brooklyn: Sasha's Kitchen: Toasted S'mores Cupcakes And A Cupcake Necklace Giveaway! Sasha's Kitchen: Toasted S'mores Cupcakes And A Cupcake Necklace Giveaway! I love s'mores. Ever since I was a kid, s'mores over a campfire were one of my favorite summertime treats. I liked a deeply toasted marshmallow, all gooey and browned, sometimes even a tad on the burnt side. When my husband and I got married, on the first night of our honeymoon we had s'mores for dessert at out hotel, The Grand Wailea in Maui. That was the perfect setting for lovely beachside/tableside s'mores on a September night. Cupcakes are my favorite baking project, so for the start of a beautiful spring, it was only natural for me to prepare a s'mores cupcake. These s'mores cupcakes weren't toasted campfire-side, but they were toasted using our kitchen torch (more commonly used in creme brulee preparation). They incorporate all three elements essential to genuine s'mores: toasted marshmallow, chocolate and graham cracker. I made these on the perfect Friday night with one of my favorite people and sous chefs, my friend and cousin Alicia. They were also the perfect dessert to our Saturday brunch yesterday that we hosted for some close friends. The marshmallow frosting was perfect - it toasted exactly like a true marshmallow would have in the campfire, and even crackled the same way as a marshmallow when contacted with the creme brulee torch. I suggest making these to bring back memories of those perfect summer nights when you were a kid. These are also perfect to make with children if you don't have the opportunity to make it to a real bonfire. They taste completely authentic and are fun to prepare. The recipe is below, but first, I am providing details on my very first site giveaway! 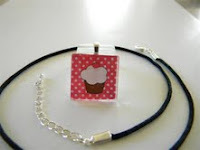 CUPCAKE NECKLACE GIVEAWAY DETAILS: Also, I am giving away two cute glass cupcake necklaces from New York Designer Moon & Star Designs to two lucky readers of this blog!!!!! To enter in this Giveaway, 1) comment on this post with your email address or 2) or send an e-mail to giveaways@akitcheninbrooklyn.com. You must be a follower of this blog on the follower tab (located midway down on the right sidebar of the blog, since I am not sure if this link will work) OR a fan in my facebook fan group to enter because I want to reward facebook fans and blog followers. Preheat the oven to 350 Degrees. Line two muffin tins with cupcake liners. Combine the dry ingredients (flour, baking powder, baking soda, salt, cocoa and sugar) in a mixing bowl. In a large bowl, combine the eggs, milk, oil and vanilla. Put in a mixer and combine the wet and dry ingredients, scraping down the sides of your mixer as you mix on medium speed. Add the boiling water and stir to combine. Set aside. Combine the graham cracker crumbs, remaining 1/4 cup of sugar and butter. Place 1 tablespoon in each cupcake liner and press into the bottom of the cupcake liner. Bake for 5 minutes at 350 until lightly browned. Then, add the cupcake batter to each cupcake, about 3/4 of the way full. Bake at 350 until done (testing with a toothpick) for about 20 to 25 minutes. The toothpick should come out clean when the cupcakes are done. Prepare the Marshmallow frosting by placing the sugar, egg whites and cream of tartar in a metal bowl over summering water in a double boiler. You can simply use a small metal bowl floating in a pot of simmering water. Whisk or stir constantly until the sugar is dissolved, over medium heat, for 3-4 minutes. Stir in the vanilla and transfer to your stand mixer. Fit the mixer with the whisk attachment and beat on high until it forms a marshmallowy-meringue. You will need to beat continuously on high for five to seven minutes until the marshmallow frosting looks like the picture below. You will need a stand mixer (or at least a hand mixer) to make this frosting. Froast the cupcakes using a frosting bag fitted with a plain round or french tip. I used a french tip. Then, follow the instructions for your creme brulee torch to toast the marshmallow frosting. It toasts very quickly, just like a marshmallow would in intense heat. Thus, you will only need to brulee each cupcake for no more than 15 seconds. Like I said above, when you eat this, it is just like eating a s'mores, only in cupcake form. These were enjoyed by all of our friends who got to try them! How fun is that! I think even my hubby could get into baking if he got to use a blowtorch (he's more of the meats and stews cook in our house). Thanks for the add on Foodbuzz! Following your blog now and I'm excited for a shot at winning one of those adorable necklaces! Oh, and I'm a Facebook fan too! Your cupcakes look amazing.My grandsons are going to love these. This was a great idea. Those cupcakes look amazing as does the necklace! These look beautiful! I'm definitely saving it for a rainy day. Ooh, I wish I had a kitchen torch. I always use those at the restaurant-hmm? Nice looking cupcakes too-now I'm hungry! I just had smore cupcakes at Kara's and wanted to recreate it at home. Your post inspire me to quickly do so! WOW what a beautiful display Sasha. Love the torched tops. Hopefully, One day I'll become so skilled! Aren't those torches fun? I've seen lemon meringue cakes and tarts having fun with a torch, but not smores cupcakes. I did make a smores cake once, but it didn't have the cool singed meringue! Nice job on these. Glad you liked these cupcakes, they look like perfectly roasted marshmallows. Your cupcakes look so delicious! The topping is perfect! I will mention the giveaway in my post tomorrow - hopefully it will bring you some more entries. that looks awesome and gooey even if i don't like marshmellows I'd give that icing a shot. Looks sweet and sticky. A great combo and post.